While we ecommerce marketing and operations types are consumed with planning for huge traffic spikes during holidays and other busy seasons with email campaigns, landing page design, merchandising strategies and inventory planning, our technical counterparts must ensure that the IT environment can support rapid increases in visits and database calls, that new projects are launched quickly and that systems are secure, all within carefully scrutinized budgets. Oh my! This is why “cloud computing” is so hot right now. It shows promise in being able to achieve these objectives better than running applications in an organization’s own environment. Last year, we invited IT leader and cloud computing expert David Linthicum to contribute some 101-type articles for Get Elastic’s Technical column on the topic of cloud computing and enterprise ecommerce ( <- catch up on the posts here). “…any IT resource, including storage, database, application development, application services, etc., that exists outside of the firewall that may be leveraged by enterprise IT over the Internet. The core idea behind cloud computing is that it’s much cheaper to leverage these resources as-a-service, paying as you go and as you need them, rather than buying more hardware and software for the data center. There are other advantages as well, including elasticity, or the ability to rapidly scale up cloud computing-based systems, rapid provisioning of cloud computing assets, such as storage and database services, and a much more cost efficient model than on-premise systems. 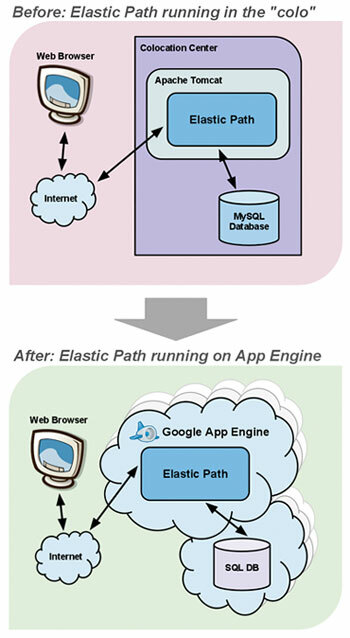 Here at Elastic Path, we recently completed a project with Google to move its Google Earth Pro and Sketchup Pro storefronts and commerce managers from a environment (Apache and Tomcat with a MySQL database for you programming savvy folks) to Google App Engine (Google’s own cloud service), with plans to migrate its database and remaining parts next. While this is not quite “outsourcing” in Google’s case, nor does it shift risk away from itself to another party, Google believes increased security, easier deployments and operations, scalability, cost effectiveness and built-in monitoring make the migration worth the effort. 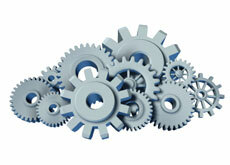 Should your business head for the cloud? 1. Do you have excess capacity standing by (e.g., idle servers and databases) for the time when your ecommerce systems need the additional processing power, such as the holidays? 2. Are security requirements around the information you retain and/or process low to medium? 3. Will your business benefit by the preservation of capital? 4. Will cost reductions have a direct benefit when considering the profitability of the company? It’s interesting to note that the questions above are more about the business benefit of cloud computing than the technological advantages, and that’s the way those who maintain and deploy ecommerce systems should look at them. You might not be on the IT side, but part of bridging the IT and marketing divide is learning one anothers’ language. That’s why it’s important to understand the “what and why” around cloud computing. Profitability is not just about driving sales but also reducing costs and improving efficiency. Tapping into on-demand cloud services is one way IT works to help support your organization and your marketing efforts (including ensuring reliability and scalability through the high season)! See you at Google I/O? The Elastic Path crew will be on board at Google I/O this week to exhibit what we’ve done. If you or any of your developer colleagues will be attending, please drop by App Engine pod.